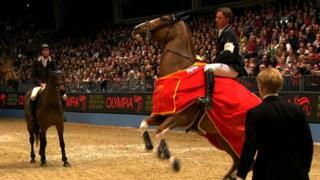 Ben Maher drops his winning trophy at Olympia when his horse, Diva II, becomes unsettled. The former world number one quickly regains control and smiles to the crowd at the London International Horse Show. Maher earlier came through a tense jump-off to win the Olympia Grand Prix.